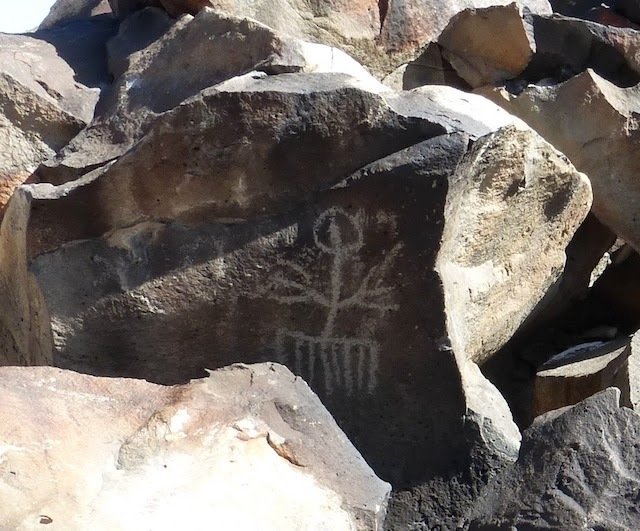 Ten years ago I visited the Rodman Mountains Petroglyph site and was amazed. That was the first petroglyph site I had ever visited. It was easy to get there in my 2003 Acura MDX. I decided to return to the site because I had heard that a pending expansion of a military base was going to close access to the site. It's still easy to reach, even in street cars. You'll just need a ground clearance of about 7 inches or more. Here's a google map centered on the parking area. The best glyphs are located on black rocks in a wash named Surprise Tank about 1 mile to the east at the end of a easy-to-follow trail from the parking area. This google map is centered on the Surprise Tank site with the many glyphs. Camp Rock Road is graded and easy. Beyond Camp Rock Road continues to be easy because it's used by the mining trucks (see the mining operation in the distance). After turning east off that road and onto BLM route 8640 it gets a tiny bit bumpy. This is about as hard as it gets. The entrance to Surprise Tank. And in no particular order, here are some of the glyphs. Sorry for the poor quality shots. I was mindful of exposure settings only a few times, and they stand out. Now for a confession. Since I hadn't been there for 10 years, I forgot how to get to the tank from the parking area. I was wandering around hoping to trigger some long lost memory. Luckily, another group arrived and I followed them to the glyphs. Thanks very much to Don for his kind help.